Pregnancy is a time of development for your baby, and it is important that you provide everything your baby needs to do this properly. 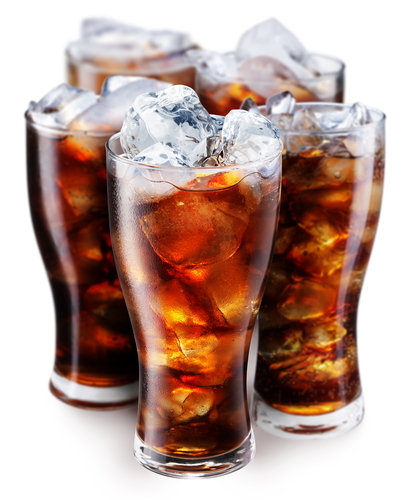 Caffeine in sodas like Coke or Pepsi may worry many women because they are unsure if it will harm the baby. Many doctors agree that all caffeine should be avoided if possible,and there is some evidence that caffeine even in small amounts under 200 mg a day (2 cups of coffee or 5 cans of soda) can have an increased risk of a miscarriage. Caffeine can cause low birth weight if it is used too much, so it is important to try and limit these sodas to special occasions or certain times or places while pregnant, to give your baby the best chance at a strong and healthy beginning. Scientific studies have shown that animals who are pregnant have smaller babies, and there is very strong scientific data to prove this is true of humans as well, and the more caffeine consumed the lower the birth rate may be. This may be because the caffeine has a stimulant effect, and this may cause the slower weight gain in the fetus because of this.Many doctors feel that when used in moderation these drinks do not necessarily harm the fetus. Up to three eight ounce servings of these sodas may be acceptable.. The less caffeine you use during pregnancy, the less the risk is that the drug will have any effect at all on your baby. The only way to ensure that you won't do any harm is to say away from caffeine in pregnancy. Besides caffeine, the other problem with having sodas in pregnancy is that they contain too many empty calories, so if you want to drink, then you may want to choose something more nutritious such as natural juices mized with carbonated water.